How true this line is in context of Mahabharata. 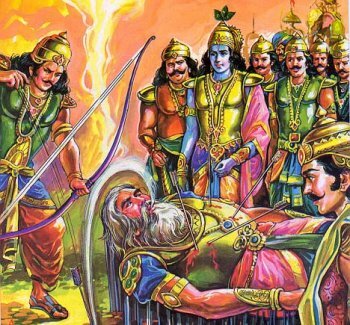 It is believed that Mahabharata is a symbol of victory of truth over lies, but here are few incidents related to revenge. Based on these we can say that this epic from Indian mythology contains lots of hatred as well. We can open a whole debate of what Mahabharat is all about. And this does not take away the magic of this epic. Read the following Indian stories from Mahabharata. You will agree that revenge is indeed a strong feeling in Mahabharata. Amba got her revenge when she born as Shikhandi. She became the reason for killing of Bhishma. Bhishma abducted three sisters, Amba, Ambika and Ambalika for his brothers, but Amba had to kill herself because she was rejected by her lover. This was because Bhishma abducted her. Before dying, she vowed that she will eventually will be a reason for downfall of Bhishma. In her next life, she was born as Shikhandi. Shikhandi fought the war of Mahabharat from Pandavas side. Arjuna, using Shikhandi as shield, killed Bhishma. Bhishma could not fought back because he knew that Shikhandi was a lady in her past life. Thus, Amba became a reaosn for killing of Bhishma. King Drupada got his revenge when Dhristadyumna, his son killed Drona in the battle of Mahabharat. Drona and Drupada were childhood friends and Drupada later became a king. Drona reached out to him for financial help but Drupada did not treat him properly. Drona vowed to took revenge and later Pandavas presented him before Drona as a prisoner. Drupada vowed that he would beget a son who would kill Drona. Dhristadyumna was born as his son who killed Drona. Draupadi, the wife of pandavas, was the daughter of Drpada and sister of Dhristadyumna. Dushashana insulted Draupadi and dragged her by her hair and paid heavily with his life. Draupadi vowed that she would tie her hair only when they are covered with Dushashana’s blood taken out from his heart. Later Bheem, her husband killed Dushashana and broght the blood from his heart to Draupadi. Satisfied, Draupadi tied her hair after they were immersed in Dushashana’s blood, when Bhima killed him and brought blood from his heart in the mahabharata war. Duryodhana also insulted Draupadi and asked her to sit on his thighs. Bheem vowed to break his thigh. In Mahabharata war, he did the same. This was against the rules of war, and Balram objected, but nevertheless, Krishna intervened. Thus, Bhima was able to took his revenge. There is also an interesting story of how Duryodhana’s thigh was vulnerable. Rest of his body was strong as a rock and impenetrable. When Panadavas were living in hiding during their Agyaatvaas, Kichak was troubling Draupadi. He was making undue advances towards her. One day, Draupadi invited him to a clandestine place. Bhima was waiting for him. Bhima killed the mighty Kichak. Kauravas realized that Pandavas may be hiding there only since there were only few people who could overpower Kichak. Bheem was one of them. This aspect of mahabharat fascinates me so much. Every small story is related to another story. For example, death of Kichak was a significant event. This led to Kauravas realizing where Pandavas are hiding. dig not one but 2 graves.One for him and the other is your own. this is true in mahabharata. Very well said Niraj. Revenge does not serve in good stead. What we see here that this epic contains characters and incidents which do not do justice to their reputations. Imagine a Guru looking for revenge. But these incidents do make these characters look real. Please send any idea on what you would like to see on this site. Responding to your statement Please send any idea on who you would like to see on this blog. Ramayana and Mahabharata usually formed by a loose assumptions based on multiple readings with the result many heroes of these epics are unnecessarily faced with criticism. I would like to see theses false accusations cleared. One such a case is Lord Rama. Accusation no1 : Dhobi ke kehne pe Sitaji ko tyag di ya. My Exp : Many a times great people do unconventional things to bring out the greatness of another person. Vishwamitra created a lot of unfavorable circumstances for Raja Harishchandra to prove to the world that Harishchandra is the greatest satyavadi. Although Lord Ram and Sitaji were husband wife the philosophy was very much similar. Lord Rama had to bring out the greatness of Sitaji in front of Ayodhya vaasis. For great people like Sitaji pride and honour are more important than palace life. Lord Ram respected that sentiment of Sitaji and precisely engineered a series of events so that her greatness is sung for years to come. Just as vishmamitra hurting harishchandra does not make vishwamitra evil similiarly Lord Ram doing the same thing does not challenge his character reason is that Sitaji was not an ordinary person proving her greatness to the world was more imp than palace life. My exp : Its Surpanakha who was the aggressor. Who said unarmed person cannot be dangerous. She had big nails she could strangle. Improper conduct is punishable from both males and female. An analysis is done purely on dharma and adharma. Feanor: Penguin India has done a fine job in making avlalabie good translations of classics and modern classics (e.g. Parashuram’s stories and Fakir Mohan Senapati’s Six Acres and a Third) in recent months. Hope that continues. Also hope I find the time to read some of them!Neha: to me, Rajagopalachari’s book is overrated because nearly every time the subject of the Mahabharata comes up, someone or the other tells me that they’ve read only the Rajagopalachari version and thought it was brilliant. (I’m talking about adults here, not 12-year-olds, who are the ideal readers for that book – it’s the next step up from the Amar Chitra Katha versions. )C Rajagopalachari’s book is condensed and hence only shows characters in their dominant nature…I would argue that for a work as full of complexity and contradiction as the Mahabharata (and as dependent on those complexities for it to be meaningful), this is a big flaw. Condensations do have their place, of course, but we tend to grow out of them eventually (at least if we’re making a genuine attempt to experience the work in question).I should add here that my feelings about the Rajagopalachari (and R K Narayan) condensations also come from my own perception of the Mahabharata as a great, multi-layered work of literature, not as a simplistic good-vs-evil story with a facile moral. Interesting article on a controversial theme. Mahabharat – A story of revenges. The greatest thing about the epic is its many lareys of human behaviour. I would even say that people teaching organisational behaviour or human psychology, should make an in depth case study of some parts of Mahabharta. There is a great deal of complexity found in the magnificient epic. It does not preach you extended and superficial sermons of morality and piety ; but is superb in its depiction of the complexities of human nature.The characters of Pandavas , Drona , Bhishma ,Draupadi are so open to different interpretations that various theories or new literature can be written by just analysing their actions. I believe this is the greatness of Mahabharta which makes it as probably the greatest epic known to mankind. Puranas, unless and until we have any solid proofs/ points to defend our statements. Personal opinions/ assumptions would mostly be baseless and cannot be trusted up on or considered for further arguments.